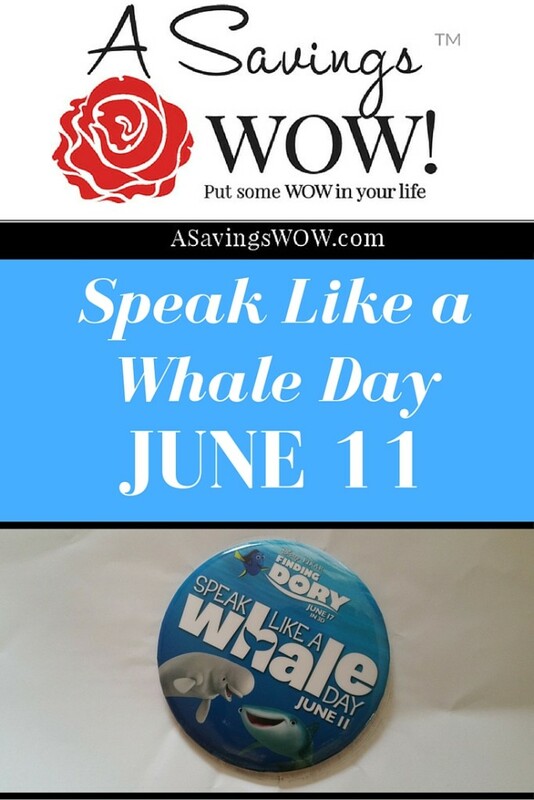 Speak Like a Whale Day - June 11 | A Savings WOW! You are encouraged to take part in Speak Like a Whale Day by speaking whale wherever you go, uploading videos of yourself and tagging #SpeakLikeAWhaleDay. You’ll also see programming related to Speak Like a Whale Day on Disney channels, including ABC, ESPN, Disney Channel, Radio Disney and Freeform. – Guests of the theme parks at Disneyland Resort in California, Walt Disney World Resort in Florida and Disney Cruise Line ships will receive a complimentary button to celebrate the day, while supplies last. – At the Downtown Disney District in Disneyland Resort and Disney Springs at Walt Disney World Resort, families can dive into undersea themed activities, including a live DJ, games and giveaways. Also throughout the day, young guests can attend “Whale Speak University” and give speaking the language a try. -At the Seas with Nemo & Friends in Epcot at Walt Disney World Resort, guests can learn about the real-life counterparts of the characters from the film and see the in the massive 5.7 million gallon saltwater aquarium home. Experts from Disney’s Animals, Science and Environment Team will be on hand throughout the day to help guests find Dory and her friends and get a closer look at their world. – Dory and some of her new friends from Disney-Pixar’s “Finding Dory” have joined Crush at the Turtle Talk with Crush attraction at Epcot and Disney California Adventure park. Guests can now meet Destiny, Bailey and Hank. – Select theater chains will give away buttons during Speak Like a Whale Day, while supplies last. Participating chains include Goodrich Quality Theatres, Marcus Theatres, Megaplex Theatres and National Amusements. Don’t forget to watch “Finding Dory” when it comes out on June 17. I watched the first 30 minutes of the movie at the Disney Social Media Moms Celebration last month and I can’t wait to see the rest of the movie! The movie is about Dory, who’s living happily in the reef with Nemo and Marlin. When Dory suddenly remembers that she has a family out there who may be looking for her, the trio takes off on a life-changing adventure across the ocean to California’s prestigious Marine Life Institute, a rehabilitation center and aquarium. Follow “Finding Dory” on Facebook, Twitter and Instagram using the hashtag #FindingDory to find out more information!